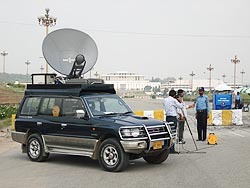 HD DSNG vans | HD studio | Islamabad - Karachi - Lahore. ETN has invested in HD encoders for its uplinking equipment in Pakistan. Its DSNG vehicles have now been upgraded with HD encoders from Advent Communications. Meeting the day-to-day needs of broadcasters with OB requirements for sports and news, ETN is now able to provide HD uplinks not only from its DSNG vans but also from all its studios in Islamabad, Lahore and Karachi. ETN states it is now the only uplink provider in Pakistan with such an extensive coverage span with HD studios and uplinking and is able to offer the most comprehensive facilities in the country.